Chapter 1: 76 Standard Solutions. Chapter 2: Absence Thinking. Chapter 3: Biomimicry (also known as biomimetics, biogenesis, biogenesis). Chapter 4: Combination Methods. Chapter 5: Concept Tree (Clustering). Chapter 6: Consumer Co-creation. Chapter 7: Creative Thinking. 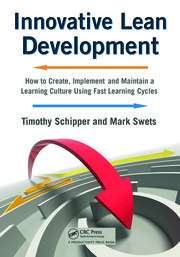 Chapter 8: Directed/Focused/Structured Innovation. Chapter 9: Elevator Speech. Chapter 10: Ethnography. 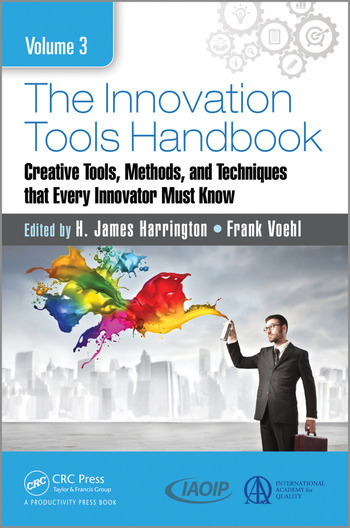 Chapter 11: Generic Creativity Tools. Chapter 12: HU Diagrams (Harmful-Useful Diagrams). Chapter 13: I-TRIZ (Ideation TRIZ). Chapter 14: Imaginary Brainstorming. Chapter 15: Innovation Blueprint. Chapter 16: Lead-User Analysis. Chapter 17: Lotus Blossom. Chapter 18: Matrix Diagram/Decision Matrix. Chapter 19: Mind-Mapping/Spider Diagram. Chapter 20: Online Innovation Platform. Chapter 21: Open Innovative Platforms. 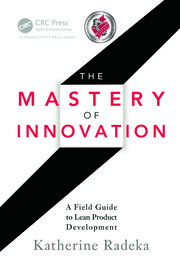 Chapter 22: Outcome Driven Innovation. Chapter 23: Proactive Creativity. Chapter 24: Proof of Concept. Chapter 25: Quickscore Creativity Test. Chapter 26: Scenario Analysis. Chapter 27: Storyboarding. Chapter 28: Synetics. Chapter 29: TRIZ. 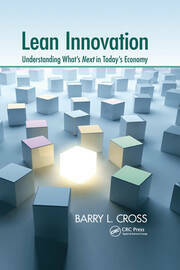 Appendix: Innovation Definitions. Dr. H James Harrington now serves as the International Quality Advisor for Ernst & Young and Chairman of the Board of Emergence Technology, Ltd., a high tech software manufacturer and developer. He also serves on the Board of Directors of a number of national and international companies. Dr. Harrington is past Chairman and past President of the prestigious International Academy for Quality and of the American Society for Quality control. He is an "A" level member of ISO’s T.C. 176 that wrote the ISO 9000 Quality System standards and T.C. 207 that wrote the ISO 14000 environmental standards. He is a member of the Board of Directors of the 14000 Environmental Management Foundation. Since joining Ernst & Young, Dr. Harrington has divided his time between working with executives to develop and implement performance improvement plans, and developing new approaches to performance improvement. As a member of the National office he has been directing his efforts to using new, creative approaches to keep Ernst & Young at the leading edge in the quality consulting field. Frank Voehl -- Summary: (1) Expert in the application of the business improvement tools and innovation methods to public and private organizations, including city, country, community government, and non-profit operations (2) Grand Master Black Belt Instructor in Lean Six Sigma and Performance Management (3) Noted author and series editor of over 30 books and hundreds of business management and improvement articles and technical papers (4) Provided input on the original design of the Malcolm Baldrige National Quality Award, and facilitated its crossover to other nations and regions, including the Bahamas, South America, Europe and the Czech Republic. Specialties: (1) Certified (Six Sigma) Application Expert, JUSE (2) Lifetime Master Instructor, QualTec Institute (3) Lean Six Sigma Grand Master Black Belt, Harrington Institute; PPN; IQF (4) ISO 9000 Lead Auditor, ASQ; Quest; Eagle (5) TQM Quality Counselor/Advisor, Crosby Quality College (6) Certified Management Consultant, CMC.